Installing unnecessary programs on your computer eventually leads to various security issues. For example, if you see WebToSave Ads appear on your screen whenever you browse the Internet, you clearly have adware programs installed on your computer. Chances are that you did not even notice how these unwanted applications entered your PC. The only way to remove WebToSave Ads for good is to terminate the programs responsible for them. If you are not sure how to delete unwanted applications, scan your system with a licensed antispyware tool. Using a professional tool is always a good choice. It does not take an expert to see that you cannot download WebToSave application onto your computer from webtosave.com. This website only offers you instructions on how to delete the WebToSave extension from your browser. It says “WebToSave was suggested to you during the install process of another application, and you have chosen to install it.” This means that the program gets distributed bundled with freeware. Users might agree to install this adware on their computers, but it is very likely that they do not even realize that some freeware app they have downloaded comes with additional features and programs. That having been said, you can be sure that WebToSave is not the only unwanted application on your computer. If you wish to determine what programs must be deleted from your system, run a full PC scan with the SpyHunter free scanner. This way you will be able to find all the potential threats and remove them at once. As far as WebToSave Ads are concerned, there is nothing reliable about them. It might seem that these advertisements try to provide you with relevant content. They usually appear when you access popular online shopping websites. However, no adware program EVER reviews the third-party content that gets embedded into its ads. 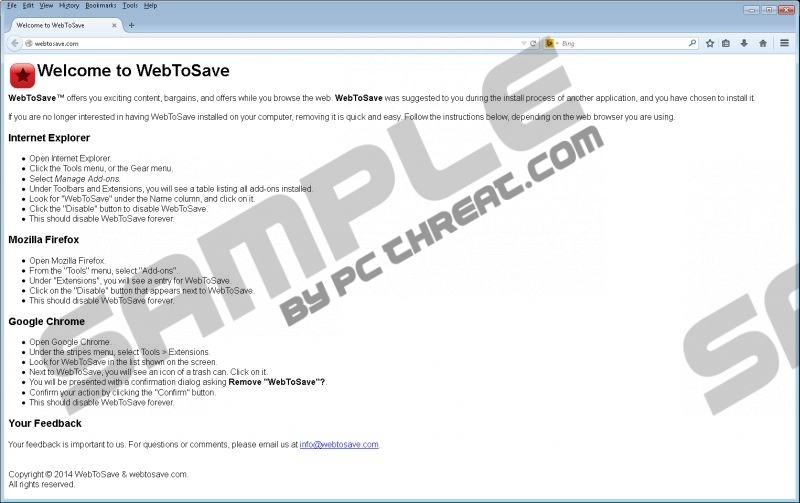 Hence, WebToSaveAds might also carry outgoing links that lead you to malware-related websites. Most of the time adware just redirects users to affiliated web pages in order to increase their traffic. As you help them to make money by increasing their traffic, WebToSave does not give you anything in return. On the contrary, in the worst case scenario it could lead you to malware infection and potential data theft. Delete WebToSave extension from your browser and then remove all the potentially dangerous programs from your computer. To safeguard your system from other unwanted intruders, do not hesitate to acquire a powerful computer security application that will help you keep your computer protected 24/7. Slide mouse cursor to the bottom right corner of your screen. Remove WebToSave from Toolbars and Extensions. Disable and remove WebToSave from Extensions. Click Extensions and remove WebToSave. Quick & tested solution for WebToSave Ads removal.